Bienvenue à Beech Mountain, un lieu magique en hiver. Les scènes sont spectaculaires et la vue ajoute à l’émerveillement de cette ville unique. Ceci étant dit.. VOTRE GRANDE vacances commencent ici! Notre cabine décorée avec goût dispose de 3000 sq. Ft. D'espace de vie pour votre famille et vos amis à profiter. Nous sommes nichés dans la plus acres de forêt boisée sur la belle Hêtre Mt. Il est serein, paisible, calme et dispose d'un enveloppement complet autour de pont pour vous de profiter de toutes les belles scènes et sons de la nature. Alors que sur le pont vous détendre dans le bain à remous pour 4 personnes ou de la roche dans les chaises berçantes enveloppé dans une couverture douce avec une tasse de chocolat chaud. Là, vous pouvez respirer dans un endroit frais croustillante air de la montagne, et propre qui non seulement efface vos poumons, mais aussi détend et efface votre esprit! De toute façon vous pouvez prendre plaisir dans les environs naturel calme des Grands Blue Ridge Mountains. Idéalement situé à seulement 2. 3 miles de pistes de ski, 4 miles à Freds (magasin général, de la nourriture) et à 1 mile de la Buckeye Rec Center. Comme notre invité pour seulement 5 $ pp vous pouvez utiliser cette installation qui offre une multitude d'activités pour toute la famille. Ceci est un must, visitez leur site Web. Notre cabine est axée sur la famille et adapté aux enfants avec beaucoup de choses à faire. Le niveau inférieur est un paradis pour les joueurs, flambant neuf avec une immense salle de jeux comprenant une télévision à écran plat plasma de 50 pieds, une sectionnelle en peluche de 9 places avec un canapé-lit queen, une bibliothèque de films, une bibliothèque de lecture, de une table de billard en ardoise pleine grandeur. Il y a la 4ème chambre avec lits superposés et une salle de bain complète. Est également la 5ème chambre avec 2 lits queen. Le niveau principal se compose de deux chambres à coucher. Chaque chambre est joliment décoré dans un décor rustique et dispose d'un lit king size avec une peluche orthopédique Surmatelas. La suite principale dispose d'une baignoire jacuzzi et une nouvelle 32 'plasma TV à écran plat. La suite principale a des portes françaises qui sortent sur sur la pellicule autour du pont spacieux (où le HOT TUB est). Il a une très grande cuisine entièrement équipée avec appareils en acier inoxydable, y compris aussi un grille-pain, mixeur, cafetière, micro-ondes, plats, casseroles, poêles, ustensiles, etc. A l'intérieur du salon, vous pourrez profiter de curling sur un des divans confortables (un canapé-lit queen) devant un bon feu dans la cheminée rustique, ou vous pouvez lire, snooze, ou regarder la télévision sur l'écran plat plasma écran, ou tout simplement contempler au loin et profiter de la vue en regardant les quatre grandes baies vitrées. Le niveau de LOFT est le troisième niveau et il ya une salle idéale mignon et agréable pour les enfants. Il a un lit queen et un pli futon et sa propre salle de bain complète. En dehors de la cabine il est encore beaucoup à faire. Il a beaucoup énorme pour beaucoup de stationnement et est plat pour vous de mettre en place un badmitton, filet de volley et avoir du plaisir en famille! Après votre jeu, sortir les hot-dogs et de s'more et toast'em dans le FIREPIT adjacente à la cabine, et ne pas oublier votre guitare, vous voudrez peut-être susciter un peu de musique de montagne autour du feu. Oops, et je oublié de mentionner, les randonnée et de nature pistes cyclables commencent à notre porte arrière. Hâte d'entendre de vous et passer des vacances géniales! My guest and I really enjoyed this place. Very private and clean. Great location; beautiful facility and easy accessibility. To start, Laura was awesome to work with. She was prompt and got our payment taken care of easily and quickly. She was available by text, and responded immediately. Upon arriving, the house is a little off the beaten path, which we LOVED. The scenery was lovely, and after the rain we've had, everything was so green and lush. The first thing we noticed was the size. It was HUGE! That was definitely a plus for us. After finding our bedroom, and unpacking the truck, we noticed mouse droppings through out the house (especially in the kitchen and master bedroom/bathroom) - which we found unusual because we were told another couple was leaving that same morning, and that the cleaning folks would be there to clean everything that afternoon. The house was generally very shabby, and not very well maintained. Not that it really matters, but the decor was very dated, and a little creepy. Lots of dusty, fake flower arrangements, and weird, stuffed animals. Not the high end over all appearance we had expected for the rental rate. The blankets/comforters were very worn, and smelled musty, the couch pillows were stained, and we read in the cabin instructions that blankets, shams, and comforters are NOT to be stripped after use. (YUCK!) The hot tub was old, and dirty because the cover on it was actually split in two. There were bugs, and tiny pieces of styrofoam floating in it. We didn't even get in it, which was a disappointment because that is one of our favorite ways to unwind on vacation. We were not able to use the pool table downstairs, because all of the pool sticks were either broken or missing tips. Again, another disappointment because that was one of our "must haves" for a property. There were a handful of yellow jackets on the main level that we had to kill, perhaps from the cleaning crew leaving the door open? The house was VERY warm, even with the windows open. Only one window in the master bedroom had a screen, so it was probably warmer than it would have been with 2 windows open. We do not get to go on many vacations because of our hectic job schedules, and when we spend just under $1000.00 of our hard earned money, on 2 nights away, we really expect a lot more. I am sad to leave this review, but would hate for someone else to make the same mistake we did. I am very sorry that we did not meet your expectations. We strive very hard to keep the cabin maintained and enjoyable for guests to use and have had 95% favorable reviews. I will try to address your comments. We do not or like any other rental property wash big heavy comforters after each use, that is why we ask not to put them with used linens. We wash them on a regular basis as needed. The hot tub had a tear in the cover and has been on order and takes approx. 5 weeks to replace. It is serviced after each use and due to the tear the foam must have broken loose and gotten into the tub. Unfortunately mouse droppings are common in the mountains, we have rodent deterrents but impossible to deter every one, same with yellow jackets. 90% of cabins do not have a/c on Beech Mt. With temps dropping into the 60's at night will cool off the cabin nicely. I was not aware that 2 screens were missing and will replace for sure. Our rustic decor including stuffed fun whimsical bears is very typical in the mountains. Sorry you did not care for this. 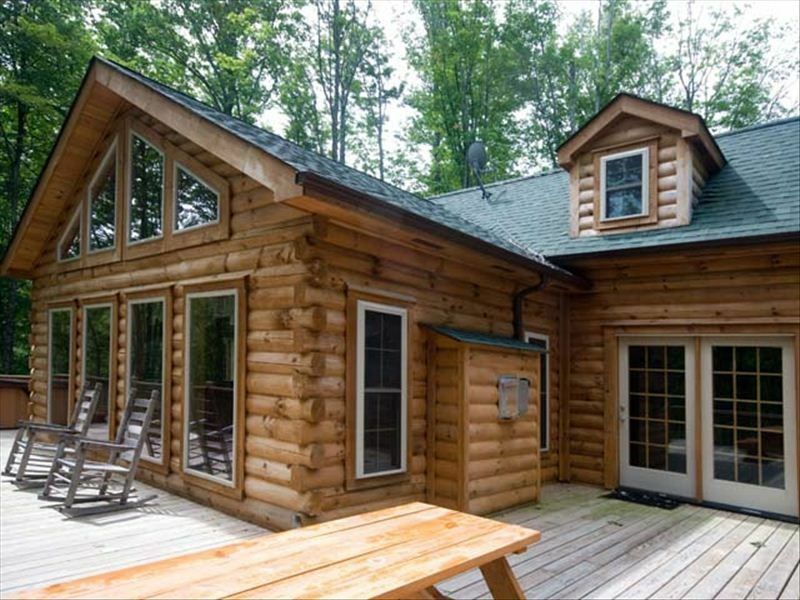 The $295 rate per night for two people may seem like alot but please keep in mind this is a large cabin (over 3,000 sq. ft. ) accommodating up to 14 guests and if 2 or 3 families split the cost, it is very affordable. Thank you for your comments and hope this has cleared up some of your viewpoints. Very quiet area with a beautiful cabin with plenty of room for 6 adults and 4 children. This cabin was perfect for our family vacation! Close enough for family outings during the day and roomy enough in the evenings with pool table and air hockey to keep us all entertained. The internet service was great to keep in touch with family and friends back home. The wildlife here was enjoyable - chipmunks, lots of deer, and other animals! I would definitely recommend for a family vacation! Also, The Apple Tree Alpaca Farm was a nice educational, fun experience for the kids! This cabin was perfect for our family of 5 adults, and our 4 kids (age 2-17)., especially having 4 bathrooms. It is showing its age a bit but is clean and comfortable. The cabin was actually within walking distance of other family members’ homes. But the cabin seemed very isolated. We had a juvenile bear visit so guests must be mindful of not leaving any garbage outside or any food in the car. Listed amenities were not there - no xbox, no game cube, one broken rocker. Hot tub had no chlorine, mildew smell. Air conditioner only cooled the lower level, upper bedrooms were very warm and hard to sleep in. Firepit had only one seat. Wasp nest on back deck. Only 6 forks. Had to wash dishes frequently. We strive to give our guests the best and welcome your review. 90% of the mountain does not have a/c, our temps seldom reach higher than 75 and at night dropping into the 50-60's, ceiling fans with windows open cools cabin quickly. We are one of the few that have A/C on lower level. Additional forks will be replaced, and wasp nest removed from deck. Hot tub is serviced after each use, I believe the smell was from the hot tub cover... new one has been ordered. We have 8 chairs in the garage for firepit use, can't keep them out due to high winds on the mountain. Hope this information was helpful ! Cleaning fee for house is $175, and $60 charge for hot tub clean and balance. Additional charges apply for over 6 guests at $15 per person per night... Rates are higher on Holidays. Christmas time is peak at Beech Mountain... Rates are $695 per night. A 3% fee will be added to all credit cards for processing fee. This fee will not be applied if paid by check.